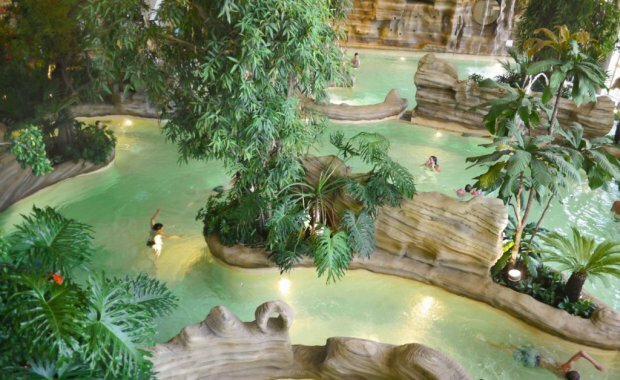 For those who do not feel like Skiing, or maybe you feel like a day off from the slopes! Here is a list of some activities in the surrounding areas to keep you entertained. Outdoor - In the winter you can scoot around on the outdoor ice skating rink situated in the tourist office square, with ice shows on Thursdays. Open every day from 10.30am to 12.30pm and 3pm to 7pm throughout the winter season. Indoor - at Parc des Dereches. Open during the day and with night sessions from 9pm - 11pm on Tuesday and Thursday, although be warned these are sometimes postponed due to hockey matches or special events. You can hire skates at both venues. 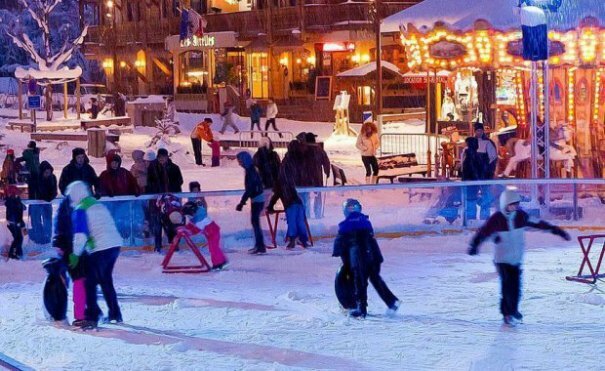 We also have our own mini ice rink in the garden when the weather is cold enough so bring your own skates if you are keen enough. 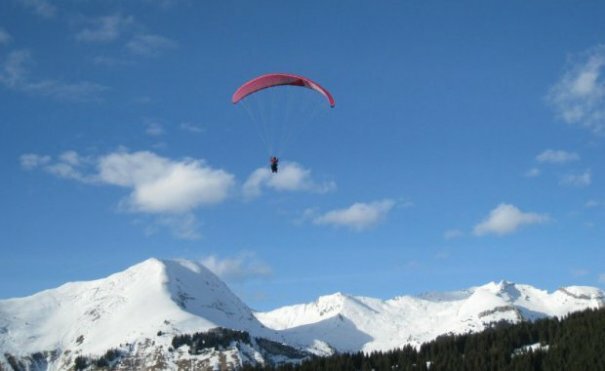 Discover paragliding – take your first flight in tandem with a qualified instructor. Avoriaz is one of the few resorts offering a magnificent 1200 meters of vertical descent. An intermediate level of skiing is required for winter take-offs e.g. able to ski blue runs with confidence. Other flights and helicopter pick-ups are possible. 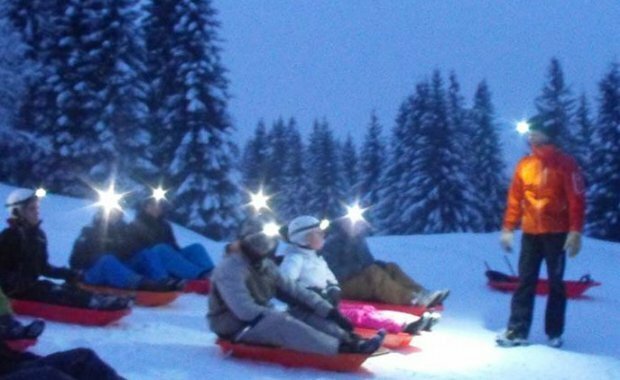 Fun for all the family takes place in both Morzine & Avoriaz, stick on your head-torch and enjoy the pistes at night. 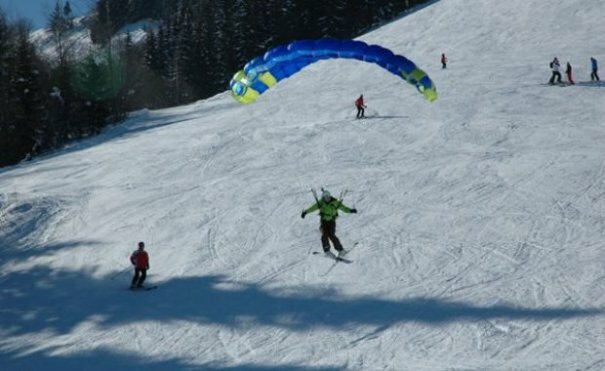 Get an introduction to this just come out activity with a qualified instructor: between skiing and flying, between earth and sky, you'll get to unreachable spots ! No need to know how to drive a wing, though you have to be a quite good skier. Price: €90 per person for a group lesson or €180 for private lesson. This company offers ice diving in Montriond and Chatel, within easy reach of Morzine. They have 15 years experience in organizing this type of diving and it's suitable for all levels of experience. Drysuits and equipment are provided. 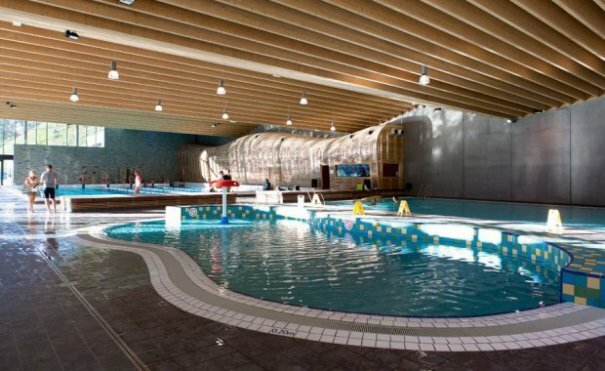 Prices are 85€ per person or 80€ in a group of 6 or more people. 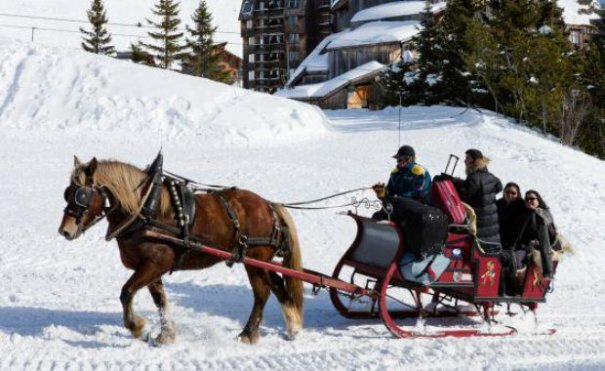 Guided tours of Avoriaz, a fine example of 20th century heritage. 5 themed rides. 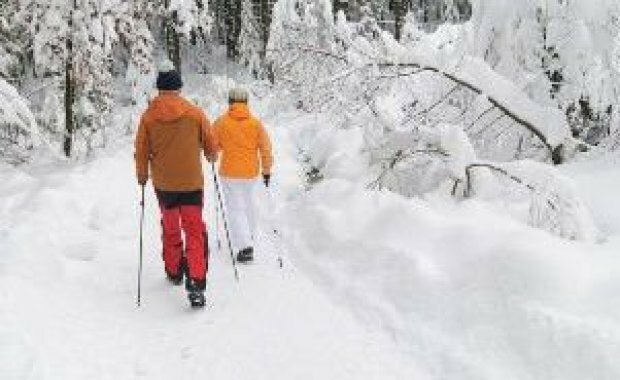 Discover the pleasure of Nordic walking in Avoriaz and the Portes du Soleil. 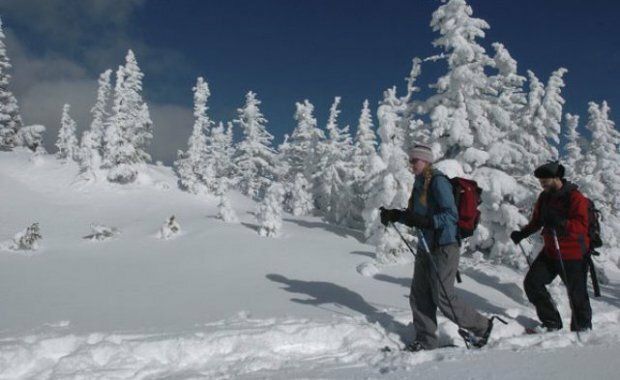 Energetic walking with poles along snowy winter walking tracks/alternating between forest trails and sunny paths. 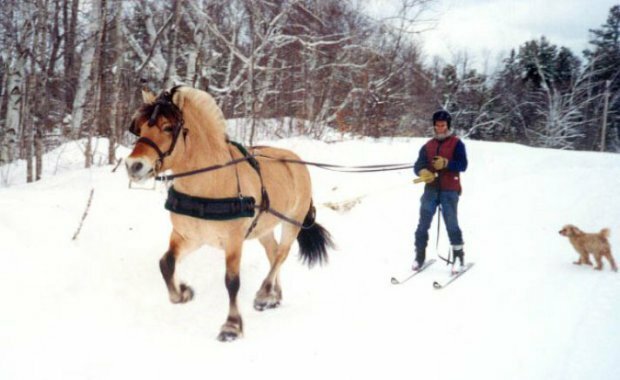 For the nature lovers, this is skiing while being pulled along by a horse. It’s a very popular Scandinavian sport. Avoriaz: The prices are 32 euros for the introductory session or 52 euros for the forest fun. Les Gets: The price is 50 euros for 1 hour ride. For more information please visit their website. Seeking the ultimate thrill? 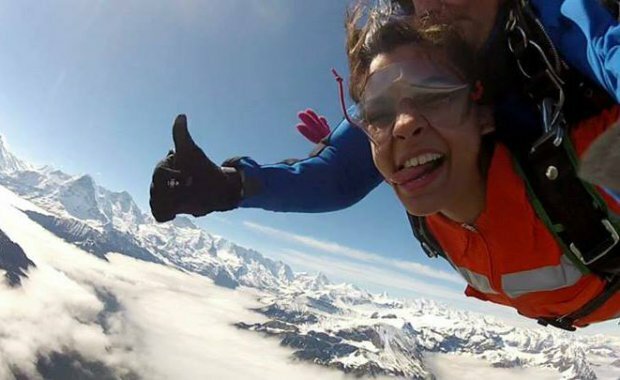 Feel what it's like to race to earth in a tandem sky-dive and really send your adrenaline levels sky-high! Cross country skiing around Montriond Lake. 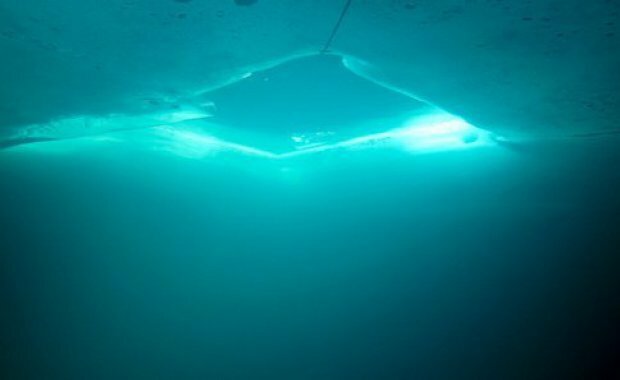 In winter the lake is frozen, in places a meter thick. 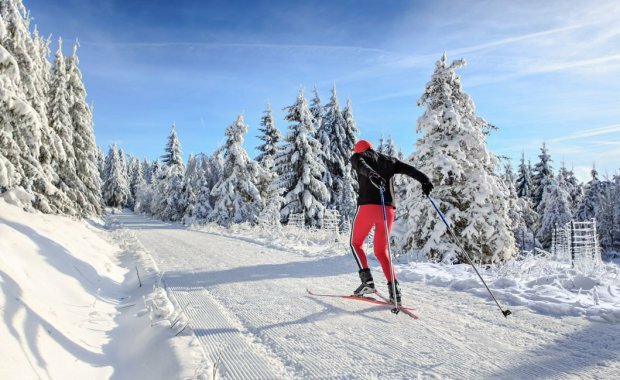 The magnificent Nordic area is perfect for cross country skiing. No ski passes necessary. The total length of the circuit as far as Albertans is about 6.5 km. The lakeside track is often used by walkers but it is wide enough to cross country skates. ESF offer group or privet lessons. For more information please visit their website. Set off along the walking trails around the area on one of these little two-wheeled electric vehicles. 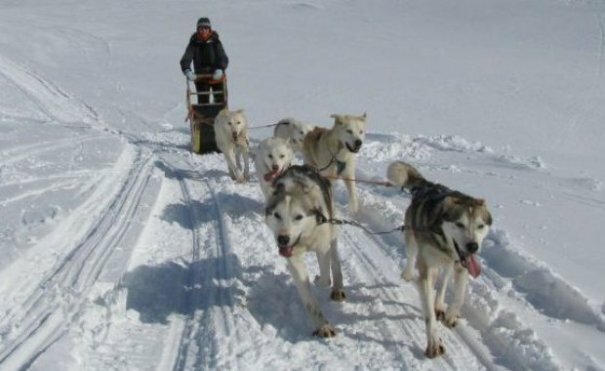 Be in charge of your own sled and team of excitable husky dogs, driving them along forest paths. After a brief explanation of how to make your team stop and start (you shout "mush! "), and strict instructions not to let go of the sled if it turns over (the dogs would disappear for hours...), you set off following the guide’s team. Your huskies want to keep up with their doggy mates, so the next hour is a breathless scramble to keep the sled upright, trying to control the speed downhill, and hanging on for dear life when you tear around corners. Prices start from €90 per adult for a 3 hour ride. 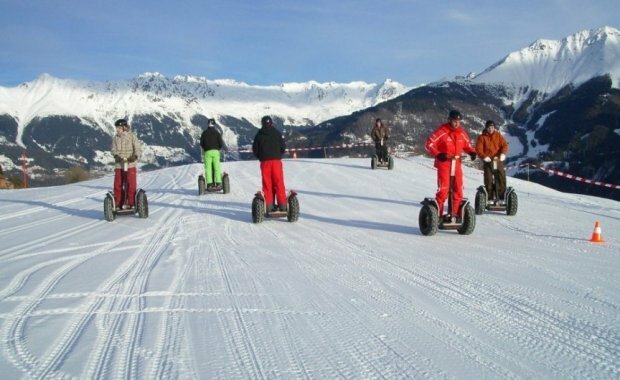 Once the slopes are closed for the night, discover the ski area in a completely new motorised way, and you will feel as if you are in the Far North! Enjoy 45 minutes of a guided 20km outing through the forest of Super-Morzine. 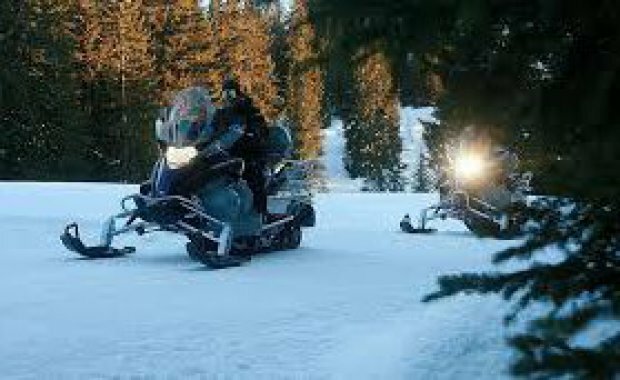 Single and tandem snowmobiles available, everyday from 5.30pm to midnight. The cost is 110 euros for 2 people and you must have the driving license and be older than 18 if you want to drive. There is also a 750 euro deposit of the snowmobile (credit card).